Border Force trebled the number of ePassport gates allowing more opportunity to use this automated, fast and secure route through the border. 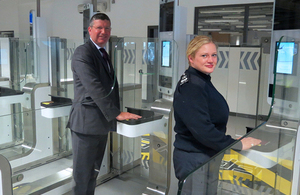 Edinburgh, UK, 2017-Aug-23 — /Travel PR News/ — The 10 new ePassport gates at International Arrivals 2 were officially opened by Border Force Chief Operating Officer Emma Moore and Edinburgh Airport Chief Executive Gordon Dewar on Friday 18 August. They are in addition to the existing 5 ePassport gates at International Arrivals 1. The new ePassport gates provide EEA nationals, aged 18 and over, and who are travelling using a biometric or ‘chipped’ passport, an automated route through the UK Border. Those aged 12 to 18 years old, and who are accompanied by an adult, are also able to use them. The gates use facial recognition technology to provide identity and security checks in a matter of seconds. The passenger’s face is compared to the digital image recorded in their passport. Once complete the gate opens automatically to allow cleared passengers through the border. Border Force officers monitor the system and any travellers rejected by the gates are directed to the normal clearance desks to be seen by an officer. Automated technology, such as ePassport gates, gives Border Force the ability to process a higher number of low risk passengers more quickly and using less resource. ePassport gates provide a faster route through the border while freeing up Border Force Officers to focus on other priority work such as cracking down on the smuggling of dangerous goods and identifying potential victims of trafficking. Increasing the use of digital technology at the border is part of Border Force’s commitment to improve the passenger experience. We must protect our borders, but we also want to encourage people who boost our economy through tourism and business to travel to the UK. This means ensuring their arrival in the UK is dealt with as swiftly and efficiently as possible while maintaining the integrity and security of the UK’s border. Edinburgh Airport is one of the most innovative in the UK and we are keen to use digital technology where we can to improve the passenger journey through our terminal. We are Scotland’s busiest airport handling more than 1.4 million passengers in July alone, and the introduction of these ePassport gates will mean visitors and returning passengers will enter into Scotland’s capital safely and quickly. ePassport gates not only benefit British and EEA travellers. Nationals from the USA, Canada, Australia, New Zealand and Japan who have successfully been accepted onto the Registered Traveller programme can now also use them. Registered Traveller allows regular travellers fast-tracked entry into the UK. For a small fee, applicants undergo security checks in advance of travel meaning that, on arrival in the UK, they are able to use the EEA queues and eGates, bypassing queues for non-EEA passengers. Airport staff are available to assist passengers using the new ePassport gates, while those without electronic passports and those from outside the EU will be able to proceed through manual desks as normal. This entry was posted in Airports, Business, Travel, Travel Management, Travel Safety, Travel Tech, Travelers and tagged 10 new ePassport gates, Edinburgh Airport's International Arrivals, Emma Moore, Gordon Dewar. Bookmark the permalink.